Welcome to a glorious Sunday afternoon. There are some clouds in the sky and it has been really bright but somewhat windy. I hope it good wherever you are. I am working on a large project at the moment and apart from DT work I haven't entered any challenges for fun this week so today I have had a play with alcohol inks and produced a card to enter into the Crafty Individuals challenge for this month. I loved this stamp as soon as I saw it. (But it doesn't have a name). As I slowly increase my stamps repertoire, CI is a range that I am adding to my collection (alongside my TH stamps of course). This stamp is one I bought recently and this is the first time I have inked it up. I also wanted to link this with the Play Date Cafe colour challenge, which this week is a red, mustard and white combo. I have interpreted the mustard to include gold. The birds are a clip art download, cut out and edges inked with black soot. 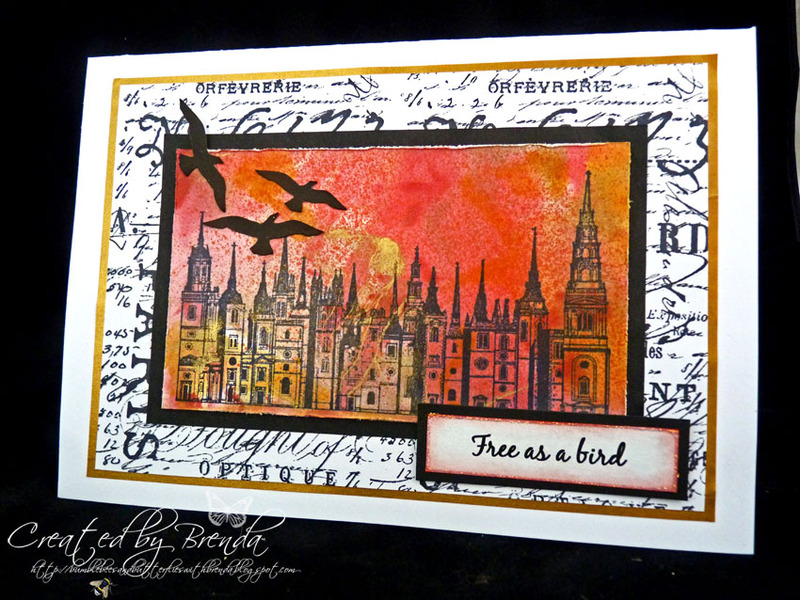 The sentiment I produced in word, and the background was stamped with the large text stamp from TH Papillon set. My blogging friend Joyce from Canada should be in the UK now and Joyce if you are reading this check your emails in a day or two as it would be lovely if we could meet up next Sunday. I hope you are enjoying the day and finding time to do something you want to do today. oh wow Brenda- i really love the .. what a fabulous scene.. and the script background is wonderful . WOW Brenda stunning card - love the colours and the image is gorgeous! I have a faintly similar CI stamp (but mine has Father Christmas and his sleigh) - super stamp range. Love what you've done with this. Glorious colours and really atmospheric, especially with the sentiment and the black and white background. I have several CI stamps and also a couple of pads of almost 'inchies' I think - stunning images they really are. Beautiful work with stunning colours. Such a gorgeous hybrid! Spot on with the colors, too! Thanks so much for playing along with us this week at The Play Date Cafe! I noticed this at the CI Challenge. What a lovely card! Very dramatic with the colours you have chosen.